Yucca is one of the most abundant plants on the sunny mesa areas around Red Rock Canyon. 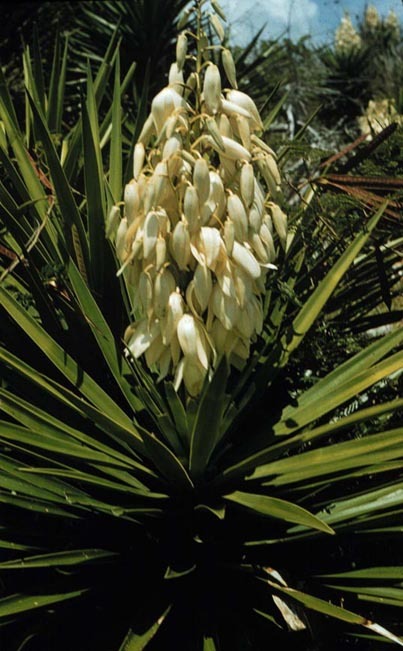 There are two species of yucca common in the American Southwest, the wide leaf Yucca baccata and the narrow leaf Yucca elata. Our yucca is all the narrow leaf species. Because of the strong, tough fibers in its leaves, yucca was woven into sandals by the Anasazi and rope by the Utes. Yucca leaves pounded at one end to expose the fibers have also been used as paint brushes. Flower petals from our narrow leaf yucca (but not wide leaf yucca) are edible and have been incorporated in several Native American dishes.